You don’t have to be a climatologist to marvel at Hawaii’s diverse climates with Hawaii’s Big Island being the prime location for climate diversity. The Big Island is home to 11 of the world’s 13 climate zones. Per BigIsland.org, there are as many different climate zones on the island of Hawaii as exist along the entire coast stretching from Alaska to Costa Rica. 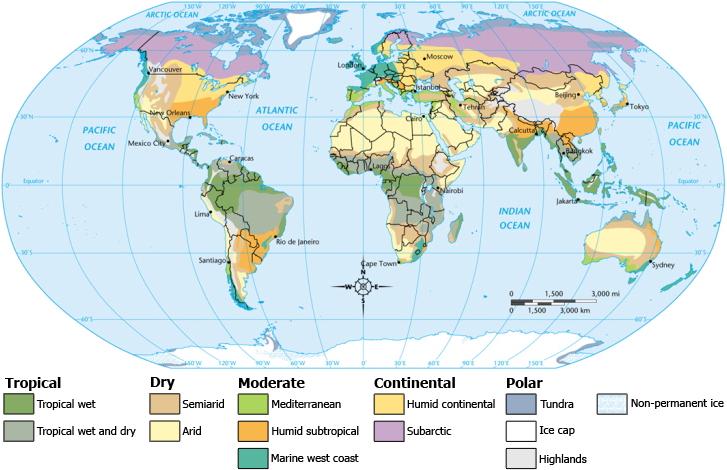 Isn’t it amazing that all of those climates exist so compactly on island in the middle of the Pacific Ocean. I’d venture to guess that there’s not anywhere else on earth where you can experience so many different climates in such a confined area as compact as Hawaii’s Big Island. Allow me to share a few photos to illustrate some of the climate diversity. Take a scenic drive from the windward to the leeward side. Perhaps one of the most dramatic drives to illustrate the differences between the wet and dry sides is a drive along the Kohala Coast of the Big Island on Highway 270. Additionally, a loop drive from Highway 19 to Highway 250 to Highway 270 will transfer you through very diverse climates, terrain, and vegetation. Take a tour from the coast up to the top of Mauna Kea. In the space of about two hours, you can go from a warm sunny beach up to a snow-capped mountain that’s nearly 14,000 feet above sea level. Drive from West Maui or South Maui to the road to Hana or to the Iao Valley. Circle Oahu from Waikiki Beach to Hawaii Kai to Kailua to the North Shore. Then before heading back to Waikiki Beach, take a diversion up to the Pali Lookout. Tour the island from the North Shore all around to Waimea and up to Waimea Canyon and Kokee State Parks. It always has amazed me that Hawaii has so many different climates in such a small area. I was just looking at photos from our helicopter tour over Maui back in ’06. Some of them look almost too different to be from the same island, but in reality it was just a short 60 minute flight all the way around. @ Kris – you bring up a great point — taking a helicopter tour is an excellent way to see some of the climate extremes on Hawaii. Thanks!